Apart from manufacturing and exporting varied high precision plants for the treatment of water, waste water and air pollution plant, we offer our incredible services in the area of complete environment pollution control system. 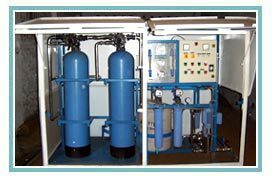 Our exhaustive range of treatment plants encompasses mineral water plant, RO plant, softening plant, DM plant, swimming pool filtration system, SAFF, FAB, aerobic and anoboric treatment, FAB reactor, MBR, ETP, STP, biler feed water plant, DI plant, desalination plant, bottling plant, stag, and many more in line to meet your demand. For the benefit of our clients, we are constantly developing new techniques and strategies that suit your requirements. Our customized products such as Water Filtration plant, wheel based canopy mounted RO plant effectively cater to varied industrial and domestic applications. We have incorporated several world-class and widely acclaimed equipment/ instruments in your products for better performance. An appropriate selection of the construction material is vital to any sophisticated system. We therefore take utmost care in selecting of proper material for the construction of each component at "H2O Solutions" Desalination R.O. system. Over the years, "H2O Solutions" has strived relentlessly to upgrade its technological standards and this thrust has given the team a wide exposure to the most sophisticated instruments/equipment. The water naturally contains dissolved and un-dissolved impurities. Un-dissolved impurities of water and precipitate sludge can be removed by some basic & highly popular filtration techniques. 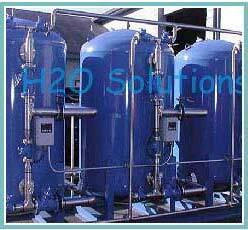 We H2O Solutions offer various types of water & waste treatment plants for various applications. H2O Solutions filters are made from mild still/MSRL/FRP/GRP/SS closed vessel and are operated under pressure. The water is passed through the filter from top to bottom, where all the unwanted impurities are left behind at the filter bed. Back flushing very easily cleans the filter bed, thus reverse flow of water flushes away the impurities deposited at filter bed. Activated carbon filter, for removal of free chlorine, phenol, taste and odor as well as reduction of COD/BOD. UF filtration to produce mineral water product and pretreatment for RO system. Aerobic and aneorobic treasury treatment for effluent treatment plant. H2O Solutions Water softener is used primarily to produce Zero soft water by highly acidic cation exchanger, which removes calcium and magnesium ions. H2O Solutions series softeners are designed for longer operating cycles, low regeneration cost. The systems incorporate the proven technique of counter and co-counter currant regeneration flow rate to economically to suit the demand of soft water for medium scale industries and commercial use. H2O Solutions Demineraliser's design is based on the latest coast effective ion exchange technique of counter current regeneration. These demineralisers consist of acid/alkali proof pressure vessel with internal fittings and initial charge of cation and anion exchanger, set of regeneration equipment, hydraulic ejectors, acid and alkali tanks and conductivity meter to monitor treated water quality. Reverse osmosis has emerged as a serious alternative to chemical treatment systems due to a number of reasons. The minimal use of chemicals makes it environmentally desirable. Reverse osmosis is a simple process and the operational and maintenance costs are lower. They can be found in varied systems that are fitted in servicing restaurants, car washes, bottled water & beverage plant, hotel/motel drinking water installations, greenhouses, ice manufacturing plants and medical & scientific laboratories, electronics and pharmaceuticals industries and boiler & cooling water application. "Membrane Technology " incorporates ozone technology based disinfection system that offers the opportunity to provide you and your family a high quality, hygienically pure and abundant supply of fresh and clear water. This technology is most commonly referred to as "Desalination" by Reverse Osmosis. This is a process in which water is forced through the semi permeable membrane with a pore size of 0.0001 micron. The small size ensures that all undissolved impurities like dirt, dust, bacteria, viruses and also the dissolved impurities like chloride, fluoride, lead, pesticides, sodium chloride and various other dissolved ions that lead to a bad taste, color and odor in your drinking water are effectively removed. These systems are mostly fitted in servicing restaurants, car washes, bottled water & beverage plant, hotel/motel drinking water installations, greenhouses, ice manufacturing plants and medical & scientific laboratories, electronics and pharmaceuticals industries and boiler & cooling water application. H2O Solution's motto is working closely with the customer right from an apt conception. We extend various services and support capabilities to assist our customers better. These include unbiased application assistance based on expertise in filtration, ion exchange and membrane separations technologies. 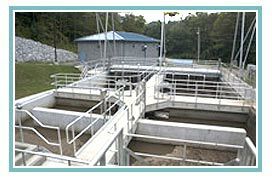 We offer complete range of solutions in the field of water treatment. Well equipped fabrication shop and team of experienced engineers, fitters, welders, electrician & technicians to repair any equipment, pumps, electrical & instruments of the system. Considerable inventory is stocked for almost all related equipments, components, spares and parts, available in emergency situation. Senior level engineers in all disciplines and experienced field staff is available anytime to solve any problem and for effective troubleshooting. We take operation and maintenance contract if required which comprises of fixed periodic visits by our service team to service and carry out replacement (Spares to be maintained by client of R.O. System and guide on operations). Quality is a hallmark of our product. We do not compromise on quality. Our special training module, developed for our employees, help in producing premium quality products. Our crew of experts ensure that the best quality products are offered to our clients. We have attained a place of respect for ourselves through our services and we are aspiring to reach the acme of perfection.